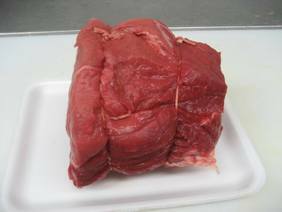 Sirloin tip also called round tip roast has a tasty mild flavor that can be purchased at a reasonable price. It is a lean roast that can be cut into countless items from kabobs to stewing beef and many supermarkets split it down the middle with each half tied into smaller roast. 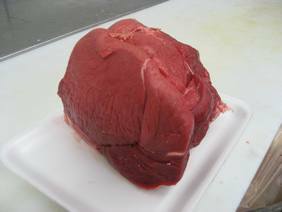 Although less tender than top sirloin or loin roast, the beef round tip roast can be quite tasty and is suitable for dry roasting but can be dry if overcooked and should be sliced thin. To bring out additional flavor and produce a more buttery texture you can dry age the roast for a few days. Age the sirloin tip in the refrigerator by leaving it uncovered on a wire rack over a pan to catch the drippings for at least a day or as long as 3-4 days. When you are ready to cook the roast, trim off any dried pieces after the aging. It is common for a roast to lose 5%-15% of its weight during the aging. A low temperature of 250 degrees will cook the meat evenly through from the center to the outer edge without any drying out, leaving the meat tender and juicy. You might be concerned about the possibility of bacteria and it has been shown that this way of cooking is actually safe but to have piece of mind there is a way to solve this and at the same time give the roast a nice brown surface. Bacteria grows from the outside and a way to get rid of bacteria is to sear the roast first. Searing the roast will seal in the juices leaving your sirloin tip recipes looking very appealing when being served. 1. An hour before cooking, remove the sirloin tip roast from the refrigerator to bring to room temperature. 2. Preheat the oven to 250 degrees and set the rack to the lower middle position. Take a heavy bottomed roasting pan or Cast-Iron Skillet , set on stove top and heat the pan or skillet to medium-high. Once the pan is hot sear the roast on all sides 1½-2 minutes per side for about 6-8 minutes total time. Season with salt and pepper and generously sprinkle your favorite seasonings, such as onion or garlic powder etc. Cloves of garlic may be used cut in half lengthwise and with a small knife cut small slits into the top of the sirloin tip roast and insert the garlic clove halves into the roast. 4. Transfer the pot to the oven and cook, uncovered until an instant-read thermometer inserted into the thickest part of the roast registers 130-140 degrees, about 1-2 hours depending on size and shape. Check the temperature 45 minutes to 1 hour after entering the oven. 5. Remove the sirloin tip roast from oven and tent with foil. Let it rest at least 15- 20 minutes to allow the juices to redistribute themselves evenly throughout the roast. Cut twine off roast and cut across the grain into thin slices. If the twine is tied correctly it should run across the grain, so just cut in the same direction the twine was tied. Below is a cooking chart for beef roast. Remember you should always use an instant-read thermometer to check the doneness of a roast. The internal temperature will rise about 5-10 degrees during resting time, remove the roast 5-10 degrees before desired doneness.